Wijkmanska gymnasiet is a technical upper secondary school that is a part of the Västerås stads Gymnasie och Vuxenutbildning which in turn is a part of the school administration of the local authority of the City of Västerås. 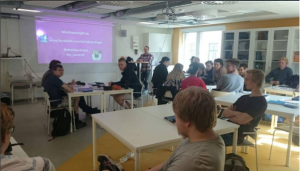 The Västerås stads Gymnasie och Vuxenutbildning organises upper secondary schools, including VET professional training for students between 16-19 years olds and technology based production industry in Sweden. The city has ongoing international projects on all of the different school levels, and internationalisation is an important part of the political and organisational agenda for the educational system of the city. A special EU-coordinator with extensive experience of students, knowledge and experiences with schools around Europe and beyond, financed by the organisation or with external funding from different programmes such as Erasmus+, Atlas and Nordplus. Several teachers are also active in eTwinning projects and are maintaining and international network. The city has ongoing international projects on all of the different school levels, and internationalisation is an important part of the political and organisational agenda for the educational system of the city. The schools and their staff seek inspiration and exchange with their peers in other countries to be able to contribute towards professional personal growth and school development. They are in constant search of additional tools to improve their capacity to actively support their students to fulfil their goals and enable them to lead a good life after school. The two main objectives are to help the students to establish themselves in the labour market and/or give them the necessary ground to proceed to university studies or other complementary studies. There is a lot of focus in the field of cooperation and mutual adaptation between the schools and the labour market, and a need for input from other organisations with a different, or similar, way of working. Taking part of an exchange with teachers and trainers in other countries therefore constitutes an important part of their continuous training and life-long learning as well as a basis for school development. The Västerås stads Gymnasie och Vuxenutbildning provides upper secondary education for approximately 4800 students every year, approximately 1200 of them are in the practical programmes receiving VET training. There are 617 teachers within the organisation specialised in different relevant fields. The schools are divided into smaller, specialised units, but support each other and also have support from the central administration, accountants, human resource, developer and coordinators. The organisation offers seventeen national programmes and work in close cooperation with the lower secondary schools of the city as well as with other providers of adult training, and the local business community. The city and the local university are working closely together in several fields such as students education, teacher training and research. Wijkmanska gymnasiet is the technical flagship of the city’s schools. It is a certificated “Teknikcollege” with a board of leading company managers, and works very closely with the local business community. It provides mainly education within the field of technology and is also a Cisco Networking Academy. The school has 350 students and 40 staff. The last two years the school has pursued a decission to enhance and increase its international cooperation, in accordance with the school’s internationalisation plan, which is coupled to the school development plan. In compliance with this, a European coordinator has been appointed, focusing on internationalisation that permeates the entire school. The intentarion is to provide qualified input to competence and school development, to support the students in their international identity and facilitate their future use of the European labour market.